Don’t let video games be the only games your kids play on a rainy day! There are so many fun and active games that let them shake out their excess energy and get their bodies moving without having to get outdoors. Tag is a classic kids’ game that of course involves lots of running! Up the thrill by getting out the flashlights and letting your kids play with the lights off. The whole family can get involved in a wholesome game of Twister, which will encourage players to move their bodies in ways they may not have before (Amazon, $24). Red Light, green light gets kids moving, but it also helps them sharpen their listening skills. They have to pay attention to what direction (Red light! Yellow light! Green light!) is being called out or they will have to go back to the starting line. Make a list of obscure items for your kids to find around the house, then start a timer and set them loose. The first child (or team) to return to you having found all the items on their list wins! The timed element will get everyone moving to beat their opponents! Hopscotch definitely gets kids’ heart rates up with all that jumping. Instead of doing it outside with sidewalk chalk, use your floor tiles as the “squares” and a small, soft ball instead of a rock. 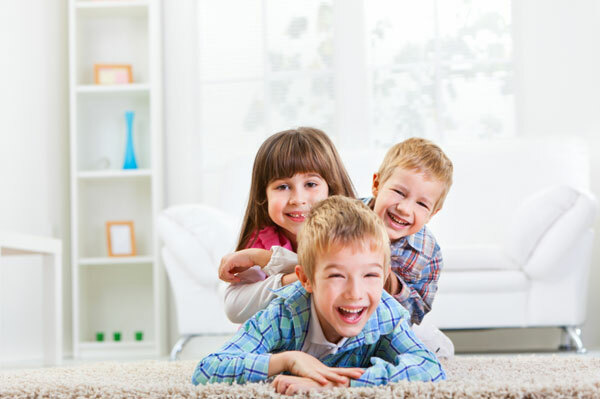 Clear some space in the playroom and let your kids play some good old-fashioned jump-rope games that are great for enhancing those memory and rhyming skills. My kids love playing sly fox. One child is designated as the fox and must turn away from the other players. While his back is turned, the fox counts to 10 (as fast or as slow as he wishes) while the other players quietly try to reach him. When the fox turns around, the remaining players must freeze. If they move or fall over, they have to go back to the starting line. If a player reaches the fox before he turns around, that person becomes the fox. Boochie isn’t an ordinary board game. It involves a variety of throwing challenges (such as tossing soft bean balls into colored rings) that will keep the whole family on its toes. The game also includes wrist trackers that keep score and a 12-sided “Boochie ball” that reads various chances for point advancement (Amazon, $30). Kathy Kaehler, celebrity trainer and USANA spokesperson, says that kids learn by example — so if you’re sitting on the couch or moping about the rain, they’ll follow suit. “The best way to encourage exercise for kids is to have them see you working out and to ask them to join you,” says Kaehler. This can be as simple as going for a walk together after dinner, heading out on a bike ride or doing a workout DVD together. It’s also important to let your kids take some time off from their exercise routine for rest. It’s important to create a balance and to teach kids the importance of taking care of their body, according to Kathy.